In this episode, Robert and I explore the Upworthy/Good merger and what it might signal for other agency/publisher M&A deals. 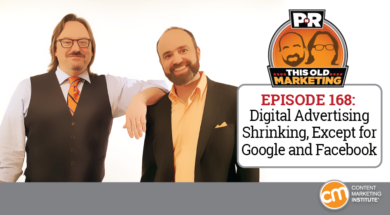 We also discuss potential revenue models Medium might pursue, and talk about why it seems like digital advertising is shrinking for all publishers… except for Google and Facebook. Our rants and raves include CMO.com and Digital Sense; then we wrap up with some home-brewed enthusiasm for our example of the week. Upworthy and Good join forces to drive social change (09:00): Media company Upworthy and social impact business Good have announced that they are teaming up to achieve their shared vision of “using storytelling to make the world better.” As reported in an article posted on the Good site, the two companies are uniquely positioned to help businesses drive social progress, given their combined reach of over 276 million people on Facebook, billions of video views annually, and a combined 31 million unique visitors per month to their websites. While agencies buying publishing companies is a trending topic we expect to be discussing a lot this year, Robert isn’t so sure that’s the true nature of this particular deal, and wonders just how the two companies’ content missions will be aligned. What does Medium’s ad pivot say about the future of online advertising? (15:53): A recent MarketingLand post offers an analysis of the possible causes behind the prominent publishing start-up’s decision to pivot from ads and sponsored posts to an as-of-yet undisclosed new revenue model. The article also offers some alternative solutions Medium – and other online publishers – might want to pursue. One suggested option I found to be particularly intriguing was the idea of monetizing the data journalists generate while researching their stories, though my experience tells me this might be easier said than done. Leaked report reveals publishers’ revenue from Facebook, Google, and Snapchat (29:40): Business Insider shares some surprising results from a Digital Content Next Study, which has concluded that publishers are receiving far less money from placing their content on social distribution platforms than might have been expected. Robert and I aren’t sure that publishers should be turning their nose down at any extra revenue they may be able to generate. But in general, we feel the most important takeaway here is that Google and Facebook stand to benefit far more from sharing publishers’ content than publishers themselves ever will. 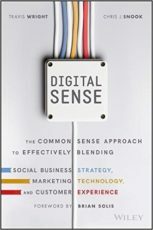 Joe’s rave: I just received a new book, called Digital Sense, which was co-written by a trusted friend of the CMI family, Travis Wright. Notably, I discovered a section where two formulas for determining the ROI of social media are discussed: Return on Influence and Risk of Inactivity. I love the latter concept, as it is one that Robert often brings up in the context of making the business case for content marketing. I’m looking forward to diving more deeply into the book’s analysis of this important topic. Robert’s commentary No. 1: This PRWeek article caught my eye, as it covers a news story that I feel everyone in our industry should be paying attention to. Holding company Ogilvy intends to consolidate all its agencies under a single P&L – a move that would enable the organization to function as a “single, branded, integrated operating company.” Robert sees this as a positive sign for Ogilvy’s clients, as well as the harbinger of a major shift in how large agency conglomerates service clients and compete with consultants. Robert’s commentary No. 2: Robert also came across an article on Cmo.com which contends that traditional personas hold little value, since they are typically based on “implicit” data points that lack sufficient depth to drive communication efforts. Robert outlines some reasons why he couldn’t agree more with this position – which just happens to serve as the basis of his presentation for our upcoming ContentTech virtual event. A home-brewing enthusiast in our audience recently wrote to us about a craft beer brewery and tavern in his local area of Concord, California, called the Hop Grenade Taproom & Bottle Shop. Not only does this business create a ton of beer-centric content for its website, it also built a broadcast studio on the premises, where it records live-streaming radio, podcasts, and videos featuring professional and home brewers from around the globe. Operating under the name The Brewing Network, this multimedia resource seems to produce as many as eight regular shows on various beer-related topics. 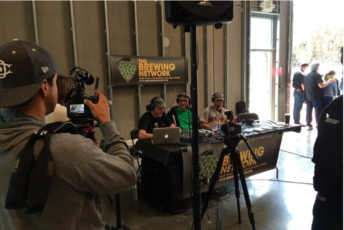 But beyond its role as a means of driving traffic to the Hop Grenade site – and to the Taproom itself – The Brewing Network functions as a fully operational media company in its own right. And it’s a self-supporting one at that: It has its own donations page and an affiliate program, as well as selling ad space on each of its shows. It’s an impressive This Old Marketing example of how businesses can use content to promote their offerings and open up new lines of revenue at the same time.